Bet Triple H over The Undertaker at +125 with Betway. Bet The Miz over Daniel Bryan at +162 with Betway. Bet Bobby Lashley and John Cena at -500 with Betway. When you talk about names engrained in the fabric of WWE for decades, two of the biggest are Triple H and The Undertaker. Their rivalry spans more than 20 years wrestling on the smaller stages right up to the biggest in WrestleMania. Their respective evolutions within the business have been intertwined for generations of fans. All this history will be on full display at WWE Super Show-Down at 5 a.m. ET Saturday, Oct. 6 from the Melbourne Cricket Ground in Melbourne, Australia. The match is being billed as the last chapter in their legendary feud. Adding to the nostalgia is the fact Shawn Michaels and Kane will be in the corners of Triple H and the Undertaker, respectively. Those who were watching during the “Attitude Era” know the past between all the deeply rooted elements of this main event. Kane arrived in WWE by costing the Undertaker in the inaugural Hell in a Cell against Michaels. Later on, the “Brothers of Destruction” would come together. Then there is Triple H and the “Heartbreak Kid,” who were part of the original incarnation of D-Generation X and had their differences as well. So, in many ways each side have that complicated love/hate relationship. Most days Triple H has traded in wrestling tights and the ring for a suit and the boardroom. 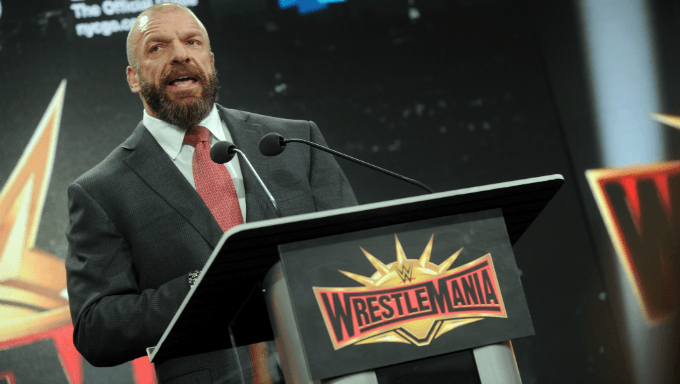 Paul Levesque filled into his role as executive vice president of talent, live events and creative. The Undertaker appears sporadically, usually around WrestleMania time, although the “Phenom” wrestled more in 2018 than in recent memory with the recent global expansion of WWE and stadium events like Super Show-Down. Triple H and The Undertaker have faced off at WrestleMania on three occasions. The first took place in 2001 inside the Houston Astrodome. Then 10 years later they continued the series for WrestleMania 27 at the since demolished Georgia Dome in Atlanta. This was followed up with an “End of an Era” Hell in a Cell battle at WrestleMania 28 under the Miami Gardens open sky at the now-called Hard Rock Stadium. The final installment saw Michaels serve as special referee, and every outing featured Undertaker coming out on top keeping the streak alive. Punches weren’t thrown physically up until the last Raw between The Undertaker and Triple H, but there sure has been some verbal jabs. Each Monday night leading up to the Super Show-Down, WWE has produced videos asking other legends including Ric Flair, Kurt Angle and “Stone Cold” Steve Austin who they think will win. Triple H, Undertaker and Michaels at different points adding fuel to the fire. Kane went after Michaels during the last segment of the go-home show, which prompted Undertaker and Triple H to enter the fray. The final iconic visual was the “Brothers of Destruction” raising their fists in the air at the entranceway after leaving the founding fathers of DX laying. Shawn Michaels Out of Retirement? Given the picture of finality WWE has been painting between Triple H and Undertaker, it’s hard to think the match will end in a disqualification or count out. Another thing to consider is the talk of Michaels emerging from retirement. One can point to the seeds being planted a few weeks ago when Undertaker poked at HBK’s reasoning for stepping away. Michaels performed last in 2010 at WrestleMania in a losing effort against ‘Taker at University of Phoenix Stadium in Glendale, Ariz. He remains active in WWE working as a trainer at the WWE Performance Center. The timing and story told makes Michaels’ return for at least one more match likely. And having Kane in the mix could be laying the groundwork for a future blockbuster tag team match. The possible time and place leans toward Crown Jewel, the second WWE Network special airing live from Saudi Arabia on Nov. 2. In the end, expect the catalyst to happen at Super Show-Down. I am going against the grain and take Triple H to finally defeat Undertaker after coming up on the losing end so many times before. In the scenario, I envision Michaels affecting the finish in some way. It will open up a wealth of possibilities for the future. Bet Triple H at +125 with Betway. The Undertaker is the favorite at -175. John Cena is returning after a lengthy hiatus filming movies and TV projects. I see him victorious here with Bobby Lashley. You can get Bobby Lashley and John Cena at -500 and Elias and Kevin Owens at +333 via Betway. I believe there is more to best friends turned bitter enemies, so I have Lynch retaining. You can bet Becky Lynch at -188 and Charlotte Flair at +137 with Betway.